In November 2017, Ursula K. Le Guin reported that her health was "OK." This was what she said in an interview with David Streitfeld, published in the Los Angeles Review of Books. 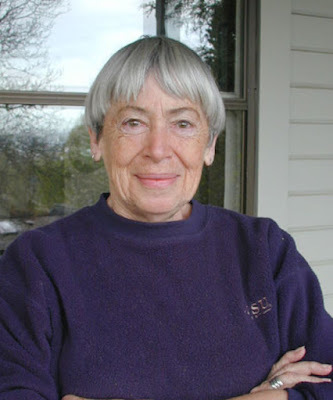 Le Guin died on January 22, 2018, and I wish her health had been better than just "OK." As a brief appreciation published in The New Yorker makes clear, losing Le Guin was a real loss, though we should be grateful for all she gave us, not peeved that she is no longer here to continue her contributions. In the interview (which is where I got the image above), Le Guin noted that she was no "progressive." You once clarified your political stance by saying, “I am not a progressive. I think the idea of progress an invidious and generally harmful mistake. I am interested in change, which is an entirely different matter.” Why is the idea of progress harmful? Surely in the great sweep of time, there has been progress on social issues because people have an idea or even an ideal of it. I didn’t say progress was harmful, I said the idea of progress was generally harmful. I was thinking more as a Darwinist than in terms of social issues. I was thinking about the idea of evolution as an ascending staircase with amoebas at the bottom and Man at the top or near the top, maybe with some angels above him. And I was thinking of the idea of history as ascending infallibly to the better — which, it seems to me, is how the 19th and 20th centuries tended to use the word “progress.” We leave behind us the Dark Ages of ignorance, the primitive ages without steam engines, without airplanes/nuclear power/computers/whatever is next. Progress discards the old, leads ever to the new, the better, the faster, the bigger, et cetera. You see my problem with it? It just isn’t true. I read this statement about "progress," as Le Guin explains the term, as a viewpoint akin to my own thought that disruption is not, in and of itself, something to be sought after. What is new, bigger, and different is not necessarily going to be "better." Wise words from Ursula Le Guin.